If you are in a life threatening situation call the National Suicide Prevention Lifeline - a free, 24-hour hotline at 1-800-273-8255. Your call will be routed to the crisis center near you. If your issue is an emergency, call 911 or go to your nearest emergency room. How Is Trauma Affecting You Right Now? One of the first steps in healing from trauma is to understand the problems that you are having in your life and how they might relate back to the traumas. It is true that not every problem originates with trauma, but there are some problems that originate with trauma that you might not expect. As you look at the above image, what do you notice? Are you experiencing any of these symptoms in your life? Have any of these symptoms started to emerge and become more intrusive as you are get older? Trauma is often buried in nonverbal memories and stored in a different part of the brain than typical, normal chronological memories. 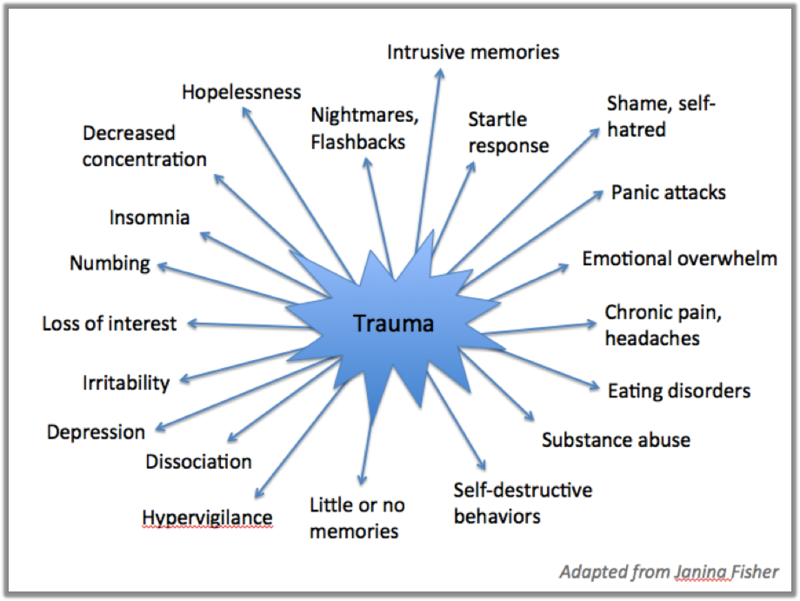 Trauma memories may be hazy images, smells, aches/pains, nightmares, escape behaviors (like addiction). Are you unable to be in certain situations? Do colors or sounds can trigger emotional responses out of proportion with the situation? Untreated trauma does not go silently into the night. Over time, non-verbal memories begin to surface and become more problematic in your life. Suppression of the trauma symptoms can take its toll and feelings that can become overwhelming. The individual may become withdrawn and immobilized from life. During trauma your nervous system goes into hyper-drive, releasing stress hormones such as cortisol. These hormones prepare you for action, like running away or fighting. If you aren’t able to run or fight, then you head for other defenses like freezing in place so you might not be seen, or playing dead. Then later after the cognitive part of the brain comes back and you experience triggers (such as an image, smell or sound), your nervous system reacts as if it’s back in the past trauma! The faithful Amygdala (the internal emergency system) fires off and the cortisol/adrenaline rush hits. The hypervigilance reigns, jumping in once again to help you survive another day! The wave hits and you get overwhelmed by emotions going from hyperarousal to hypoarousal (depressive symptoms). The good news? If you’re experiencing a number of the symptoms above, there is real help and hope! You may decide to take action today, tomorrow or next week. Either way you will be choosing to be ready and seek therapy. BUT THERAPY IS FOR THE WEAK! Surviving a traumatic experience(s) has nothing to do with "not being strong enough" to suppress problematic symptoms! Dr David Grand has helped individuals understand this principle with the analogy of surfing. Simply stated you can either ride the wave or get pounded into the reef. Trauma is subjective to the individual who experiences a particular event. For example, two individuals may experience the same event; one comes away unscathed and the other has reoccurring nightmares. Why does this happen? Is it because the person is a wimp? NOT AT ALL! Trauma stores in the brain through the body physically in the spine and brainstem and emotionally in the limbic system. During the traumatic event, when the sympathetic part of the limbic system activates dumping noradrenaline into the body to do whatever it takes to survive. During this activation all non-essential systems for survival of the moment are shut down which includes the logic and reasoning part of the brain. This creates a problem because what was experienced, is remembered physically and emotionally. That is why trauma has symptoms rather than being memory based. Simple stress response can resolve themselves without having long term effects. ​Acute stress disorder is normally symptomatic can last up to 6 months (DSM 5). PTSD can be caused from a one event experience and symptoms go unresolved for over six months. For instance, a vehicle accident. ​Complex PTSD are caused by multiple events of trauma even if they are unrelated since the brain process is the same. ​There is also what Dr David Grand has called Extreme PTSD also known as Chronic PTSD is when trauma has occurred multiple times from early childhood through adulthood. In these cases individuals can develop dissociative processes that can vary, depending upon extent and duration of traumatic experiences. ​Here is a ready resource for Post Traumatic Stress Disorder Symptoms and Resources booklet from Veterans Families United. The booklet has a personal account of Spc. Joe Collins, USAR who served in Iraq from 03-04. You may choose to read his entire booklet which is downloadable here. You may also like to review some video segments of Veterans with PTSD/TBI. Because there are presenting symptoms with PTSD that can be diagnosed as other mental health issues qualified clinicians who understand PTSD. As a Certified Clinical Trauma Professional with IATP, I look forward to helping you and your family. Disclaimer: GHP does not guarantee results or outcome of the information provided in any of its materials. NOTE!~ If you are seeking treatment for PTSD issues, there are scholarship funds available for qualifying military service members and their families from the Camaraderie Foundation!! The Camaraderie Foundation has full PAID SCHOLARSHIPS for up to 12 sessions available for qualifying applicants! I am a listed provider with the Camaraderie Foundation, so I can see service members and their families who are being affected and struggling with issues from those "Silent wounds." ​I am retired military combat service veteran and a fully Licensed Mental Health Counselor. I have been working with individuals, couples and families who have gone through historic trauma and PTSD (to include complex) issues for over four years. ​I have been trained and have successfully applied the latest powerful techniques that are making a positive difference in many individual lives and families. If you really want help and are ready for change, make contact today (850) 659-3550. I look forward to working with you along on your journey.